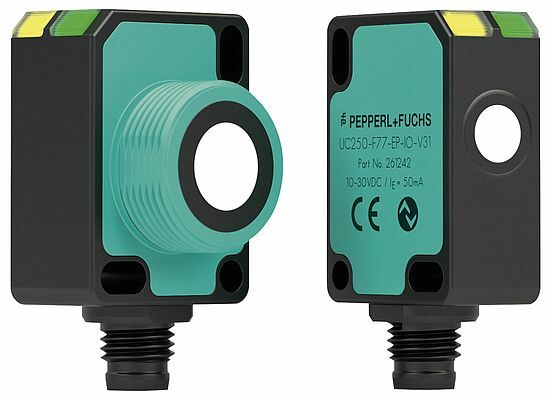 Pepperl+Fuchs introduces new compact ultrasonic sensors. Their properties regarding measuring principles make the ultrasonic sensors the optimal solution in many applications. Sound waves detect virtually any object, regardless of shape, color, contours, or material. The waves are not affected by vapors, mist, or surfaces that are reflective or transparent. The "sound beam"—the club-shaped transmission and reception range of the sensor—is not aimed at a single point, but a larger area, thereby enabling objects with holes, recesses, and irregular surfaces to be reliably detected, too. The diameter of the sound beam at the measurement point can be adapted on a case-by-case basis. Ultrasonic sensors are also resistant to dirt, dust, humidity, and splashing water. The sound-producing and sound-receiving membrane used for the process continuously vibrates and as such, automatically prevents particles from adhering to its surface. The devices in the UC-F77 series offer a number of specific advantages, including with regard to handling, mounting options, and performance. With a patented pulse process, the sensors have the shortest blind zone of the devices available on the market relative to their detection range (up to 800 mm). Since the measuring range is very large as a result, the sensors can cover many detection tasks. At only 31 mm high and 12 mm wide, the housing for this series is very small; it corresponds to a standard design and can easily be integrated into existing plants - especially since there are a variety of ways in which the sensors can be mechanically attached. A "side-looker" version can be installed such that it can turn 90 degrees to the side. The sensors are very easy to parameterize either on the device itself or with parameterization software PACTware™ on a computer. Obstructions are hidden and the shape of the sound beam is specifically adapted to the respective application. With the sensor-based synchronization solution that the UC-F77 offers as the only sensor of its size, no external intervention is necessary to calibrate the ultrasonic pulses of up to ten sensors with each other. This means that the devices can be easily operated in close proximity to one another. The IO-Link interface is also a first for this design. It makes valuable diagnostic data accessible and opens up additional communication options—including for Industry 4.0 environments.